In the United States, the Whiskey Ring was a scandal, exposed in 1875, involving diversion of tax revenues in a conspiracy among government agents, politicians, whiskey distillers, and distributors. The Whiskey Ring began in St. Louis but was also organized in Chicago, Milwaukee, Cincinnati, New Orleans, and Peoria. 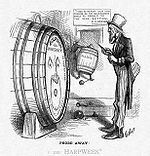 The most famous scandal was the Whiskey Ring of 1875, exposed by Secretary of the Treasury Benjamin H. Bristow, in which over $3 million in taxes were stolen from the federal government with the aid of high government officials. Orville E. Babcock, the private secretary to the President, was indicted as a member of the ring but escaped conviction because of a presidential pardon. 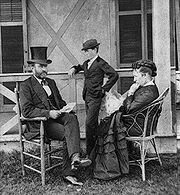 Grant's earlier statement, "Let no guilty man escape", rang hollow. Secretary of War William W. Belknap was discovered to have taken bribes in exchange for the sale of Native American trading posts. Grant's acceptance of the resignation of Belknap allowed Belknap, after he was impeached by Congress for his actions, to escape conviction, since he was no longer a government official.